It’s that time of year again! 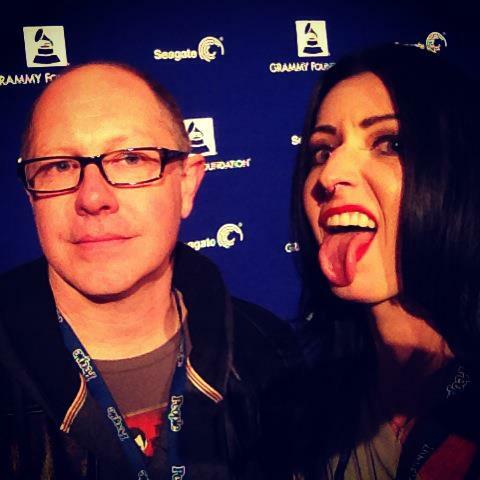 This will be my fifth time attending GRAMMY week as their Rock Community Blogger. That means, starting Tuesday night, I will be attending GRAMMY-related events throughout the week, and feeding the most rockin’ info to you. From Neil Young being honored at the Producers & Engineers Wing at The Village Studios…to what’s new in technology, social media, and music at the YouTube Space LA…to sitting in on rehearsals for the big day…to attending the Special Merit Awards where the likes of The Beatles and Kraftwerk will be honored in a small private ceremony…to maybe, just maybe, being in the pit on Music’s Biggest Night. Pretty cool, right? I will have to figure out how to headbang with an updo when Metallica hits the stage! But I’m not alone on this endeavor, and if you’re like me, you don’t just listen to THE ROCK. I am in stellar company with bloggers that oftentimes far outclass me on their day to day efforts reporting on their genre. It may even, like, be their full time job and stuff. So here are the voices of the fans in all of the genres that I get to work with this week…follow their stories, too! Baron and I have been kinda inseparable during GRAMMY week these past few years, due to repping the rebel genres and having a sincere appreciation for each other’s musical focus. He’s an encyclopedia of country, rock, country rock…and he even had a bet with The Civil Wars when they won their first GRAMMY and mentioned it in their acceptance speech! That’s cool. Linda and I are both celebrating our 5th year doing this…I can remember that first year like it was yesterday, when we were both like, “what are we doing here???”. Linda makes classical cool. Fun fact: HRC used to play the violin. I’m from Texas…so my appreciation of country music is pretty up there. I’ve seen Willie Nelson more than I’ve seen anyone else! I’m looking forward to working with Jessica for the first time this year! Occasionally I like to get my dance on, and Brent is a wealth of knowledge for this hot genre! Once upon a time, I took jazz dance classes. OK…it’s not the same thing…but Donna is one classy lady, and I always enjoy being around her wit during GRAMMY week. Plus, Jazz is a genre I’m really starting to learn about as I…mature. Arjan is super duper inspiring as a blogger; he’s on CNN and he works with Beats…all the pop stars know him, ‘cuz he’s Arjan and he’s always got that red jacket on! Arjan is the only blogger that pre-dates me, and it’s always cool to watch him work! Kimberly is a sweetheart, and she could probably tell you about that time at the Clive Davis party when I got uncharacteristically super duper excited about seeing R Kelly….seriously. There may have been a significant period of time when I turned my back on rock (after “Nookie”) and bought a bunch of Outkast CDs and got pretty immersed in hip hop. This may be Nick’s rookie year, but since I’ve started following his stuff, I have seen that he interviews EVERYONE! Impressive. Are rappers the new rock stars? Perhaps we will debate this between red carpets this week. So there you have it! 10 genres, 10 bloggers, 10 styles…follow along this week to learn and reflect and celebrate that important thing in our lives: MUSIC.